Former gas chamber, converted to lethal injection chamber. A gas chamber is an apparatus consisting of a sealed chamber into which a poisonous or asphyxiant gas is introduced in order to kill the occupant(s). The most commonly used poisonous agent is hydrogen cyanide, but carbon monoxide has also been used. The practice of using the gas chamber for executing condemned prisoners was introduced in the United States in the 1920s because it was presumed to be a more humane method of execution than hanging. The use of gas chambers in the country continued throughout the twentieth century with gradually declining use. 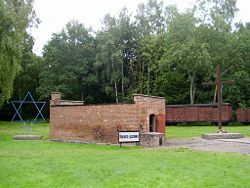 During the Holocaust, large-scale gas chambers designed for mass killing were used by Nazi Germany in its concentration camps as part of its genocide program. This shocking information, coupled with reports of the prolonged suffering of prisoners executed by this method, led to the gas chamber becoming associated with brutality. Although introduced in an effort to provide a more humane method of execution, the gas chamber itself is now regarded as an inhumane method of killing, generally replaced by lethal injection. Also, as opposition to the death penalty has increased, many jurisdictions have abolished this punishment, and thus the age of the gas chamber is coming to a close, marking another significant advance for humankind. In his book, Le Crime de Napoléon, French historian Claude Ribbe claimed that in the early nineteenth century, Napoleon used poison gas to put down slave rebellions in Haiti and Guadeloupe. Based on accounts left by French officers, he alleged that enclosed spaces, including the holds of ships, were used as makeshift gas chambers where sulphur dioxide gas (probably generated by burning sulphur) was used to execute up to 100,000 rebellious slaves. However, these claims are controversial. Gas chamber history and laws in the United States. Gas chambers have been used for capital punishment in the United States to execute criminals, especially convicted murderers. 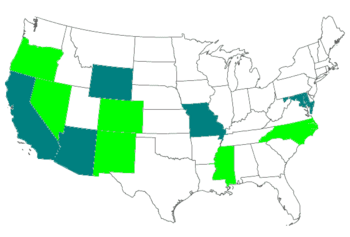 Five states (Wyoming, California, Maryland, Missouri, and Arizona) technically retain this method, but all allow lethal injection as an alternative. In fact, it is highly unlikely that any of the states technically retaining the method will ever again utilize the gas chamber, unless an inmate specifically requests to die by this method. The first person to be executed in the United States via gas chamber was Gee Jon, on February 8, 1924, in Nevada. German national Walter LaGrand, who was executed in Arizona on March 4, 1999, may be the last. The gas chamber was originally introduced to provide a more humane method of execution than hanging. Initially introduced in an effort to provide a more humane method of execution (compared to hanging), the gas chamber became controversial because of the use of large chambers to kill millions in Nazi concentration camps. Additionally, despite claims that death is quick and painless if the prisoner takes deep breaths of the poisonous gas, there were reports of prolonged suffering during executions. Following the videotaped execution of Robert Alton Harris in 1992, a federal court in California declared this method of execution as "cruel and unusual punishment." Most states have now switched to methods considered less inhumane by officials, such as lethal injection. The gas chamber that San Quentin State Prison in California used for capital punishment, has since been converted to a chamber for execution by lethal injection. The restraining table was placed where there used to be two chairs. 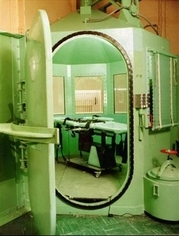 Generally speaking, in the United States the execution protocol is as follows: First, the execution technician places a quantity of potassium cyanide (KCN) pellets into a compartment directly below the chair in the chamber. The condemned person is then brought into the chamber and strapped into the chair, and the airtight chamber is sealed. At this point the execution technician pours a quantity of concentrated sulfuric acid (H2SO4) down a tube that leads to a small holding tank directly below the compartment containing the cyanide pellets. The curtain is then opened, allowing the witnesses to observe the inside of the chamber. The prison warden then asks the condemned individual if he or she wishes to make a final statement. Following this, the executioner throws a switch to cause the cyanide pellets to drop into the sulfuric acid, initiating a chemical reaction that generates hydrogen cyanide (HCN) gas. The condemned individual can see the visible gas, and is advised to take several deep breaths to speed unconsciousness in order to prevent unnecessary suffering. Prisoners have, however, been reported to try to hold their breath. Death from hydrogen cyanide is usually painful and unpleasant, although theoretically the condemned individual should lose consciousness before dying. The chamber is then purged of the gas through special scrubbers, and must be neutralized with anhydrous ammonia (NH3) before it can be opened. Guards wearing oxygen masks remove the body from the chamber. Finally, the prison doctor examines the individual in order to officially declare that he or she is dead and release the body to the next of kin. As with all judicially mandated executions in the United States, witnesses are present during the procedure. These may include members of the media, citizen witnesses, prison legal and spiritual staff, and certain family members. One of the problems with the gas chamber is the inherent danger to all involved in dealing with such a toxic gas. Additionally, both the ammonia and the contaminated acid that must be drained and disposed of are very poisonous. Gas chamber at Stutthof concentration camp. Inside the gas chamber at Stutthof concentration camp. Gas chambers were used in the German Third Reich during the 1930s and 1940s as part of the so-called "public euthanasia program" aimed at eliminating physically and intellectually disabled people, and later the mentally ill. At that time, the preferred gas was carbon monoxide, often provided by the exhaust gas of cars or trucks or army tanks. Later, during the Holocaust, gas chambers were modified and enhanced to accept even larger groups as part of the German policy of genocide against Jews, and others. In January or February, 1940, 250 Roma children from Brno in the Buchenwald concentration camp were used for testing the Zyklon B (hydrogen cyanide absorbed into various solid substrates). On September 3, 1941, 600 Soviet POWs were gassed with Zyklon B at Auschwitz camp I. Carbon monoxide was also used in large purpose-built gas chambers. They were generally disguised as bathhouses and inmates were herded naked into the building, having been told they were to take showers. The doors were then closed and the poisonous gas introduced, killing all those inside. The gas was provided by petrol engines (detailed in the Gerstein Report). Nazi gas chambers in mobile vans and at least eight concentration camps were used to kill several million people between 1941 and 1945. A large gas chamber at Birkenau (Auschwitz II) could kill 2,000 people at once. Numerous sources record the use of gas chambers in the Holocaust, including the direct testimony of Rudolf Höß, Commandant of the Auschwitz concentration camp. 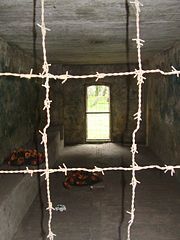 The gas chambers were dismantled when Soviet troops got close, except at Dachau, Sachsenhausen, and Majdanek. The gas chamber at Auschwitz I was reconstructed after the war as a memorial, but without a door in its doorway and without the wall that originally separated the gas chamber from a washroom. I watched Harding go into violent spasms for 57 seconds…Then he began to convulse less frequently. His back muscles rippled. The spasms grew less violent. I timed them as ending 6 minutes and 37 seconds after they began. His head went down in little jerking motions. Obviously the gentleman was suffering. This was a violent death, make no mistake about it. [...] It was an ugly event. We put animals to death more humanely. This was not a clean and simple death. Reports in the early twenty first century indicated that gas chambers were used by North Korea both as punishment and for testing of lethal agents on humans. They claimed that North Korea has used gas chambers to execute political prisoners at a concentration camp known as Camp 22 near the Chinese and Russian borders. However, questions have been raised about the truthfulness of these reports, since the witnesses were North Korean refugees, telling their stories to the Japanese and South Korean press. Some have dismissed these reports as mere propaganda, with the refugees being paid money for telling horrific stories that seem to equate the North Korean regime with the Nazi regime of Germany. ↑ Colin Randall, "Napoleon's genocide 'on a par with Hitler'" Daily Telegraph. Retrieved September 17, 2015. ↑ The Beginning of the Final Solution yadvashem.org. Retrieved September 17, 2015. ↑ Emil Proester, Vraždeni čs. cikanu v Buchenwaldu (The murder of Czech Gypsies in Buchenwald), 1940. (Quoted in Miriam Novitch, Le génocide des Tziganes sous le régime nazi (Genocide of Gypsies by the Nazi Regime), Paris, AMIF, 1968. ↑ Kurt Gerstein, Der Gerstein-Bericht (The Gerstein Report). Retrieved November 28, 2007. ↑ Donald Niewyk, The Columbia Guide to the Holocaust (New York, NY: Columbia University Press, 2000, ISBN 978-0231112000), 22. ↑ Modern History Sourcebook: Rudolf Hess, Commandant of Auschwitz: Testimony at Nuremburg, 1946 (Fordham University). Retrieved November 28, 2007. ↑ 7.0 7.1 Examples of Post-Furman Botched Executions Death Penalty Information Center. Retrieved September 17, 2015. ↑ 8.0 8.1 Antony Barnett, Revealed: the gas chamber horror of North Korea's gulag The Guardian. (Feb. 1, 2004). Retrieved November 28, 2007. ↑ Within Prison Walls BBC. Retrieved November 28, 2007. Fost, Dan. "Death watch: should TV cover the gas chamber?" Columbia Journalism Review 29(6) (1991): 15. McMurry, Kelly. "Ninth Circuit shuts down California's gas chamber." Trial 32(5) (1996): 17. This page was last modified on 23 May 2017, at 15:16.